[M]ix, consume, and write about an alcoholic drink you’ve made that resonates with the current economic turndown and explain how it addresses the theme. One of the things I have discovered as I delve deeper into mixology is that the really expensive items are the liqueurs. Green Chartreuse, one of my favorites, runs me almost $30 for a 350 ml bottle. This drives up the cost of some of the more liqueur heavy drinks, especially those with liqueurs I don’t use all that often. Instead, I’d like to focus on more affordable elegance. 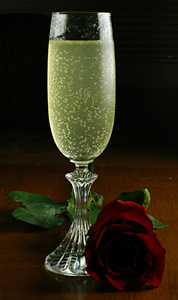 One of my favorite drinks in this category is the French 75. Knowing the drink’s name refers to the French 75mm howitzer artillery piece from World War I,1 it amuses me to think of this as an elegant drink. But then again, it is served in a champagne glass, topply with bubbles, and what can be more elegant than that? Apparently some claim that the drink was originally made with cognac, not gin, but I like the gin version, so I’m firmly in the juniper camp in this case. What makes it affordable is that the combination of ingredients means this can taste great with any decent gin and reasonable sparkling wine. In fact, I would never make this with a top-of-the-line champagne. My favorite bubbly to use is an extra brut cava, either Cristalino or Sigura Viudas. I can get a bottle of either for about $10. As it only takes about 2 ounces to make one French 75, I can get 10-12 delicious drinks from one bottle. Now, as I prefer to have two at the very most, I don’t drink these all in one night. I highly recommend the butterfly style champagne stopper. I think mine cost all of $4, and have found a bottle can last a good four days after being opened while retaining nice carbonation when I use one. The French 75 is one of my favorite drinks to experiment with a new gin, but to be honest, it’s not a drink where a quality gin really shines. Using a mid-level gin like New Amsterdam or Bellringer is going to give you a very tasty drink. But don’t shy away from using your good gin here for a special treat. The rest of the ingredients are very affordable: simple syrup and lemon juice. Shake all but sparkling wine with ice, strain into a champagne flute, and top with sparkling wine. Garnish with a lemon twist if you desire even more elegance. Many people like to rim the glass with sugar, but I find that unnecessary with the amount of sugar in my preferred preparation, and a lot easier to clean up afterwards. The French 75, along with the Pisco Sour, is one of those drinks I should start making with more citrus to sugar, to help slow me down. It’s one of those cocktails that, when well made, I find infinitely drinkable. The fact that it’s one of the more affordable drinks in my repetoire makes it even more desirable these days. Thanks to Matthew for a great topic, and be sure to check in at the Whiskey Forge for the roundup! What a lovely drink and picture Stevi! I love the French 75, it always a good choice. I make at least 4 or 5 a night while I’m bartending. A nice variation I’ve been drinking myself lately is the Applejack 75, just replace the gin with applejack.